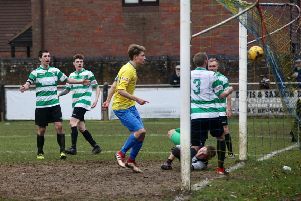 Leverstock Green had three good chances and a penalty shout, but nothing went their way as they were beaten 2-0 at home to Baldock Town at a windswept Pancake Lane on Saturday. The loss to the top-five side leaves them in 17th place in the SSML Premier table and at risk of the dropzone. It was the Green’s third defeat in a row, but they were unlucky to get nothing out of a game in which the strong wind played havoc throughout. Baldock won the game with two goals midway through the first-half, but Leverstock had three good chances and a penalty shout turned down. Levy made a good start to the game and almost had a chance in the opening 30 seconds when Reece Cameron hooked a pass through to Lewis Collins, but a defender got in just ahead of Collins. A quarter-of-an-hour into the game Collins had a genuine chance when a pass from Jamie Fulton put him clean through, but Baldock keeper Adam Harpur pulled off a great save to keep it out and Toby Syme’s effort on the rebound was blocked wide. 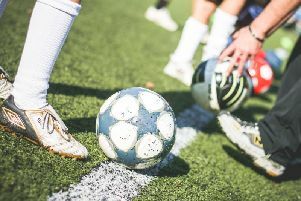 The effect of the wind was demonstrated when Mark Smith took the resulting corner – the ball got halfway towards goal but then turned back towards him. Having done well over the opening 20 minutes, Leverstock then found themselves 1-0 behind in the 21st minute when Daril Ngwala hit a shot from the edge of the area which was just out of keeper Ryan Schmid’s reach and crept inside the post. Worse was to follow four minutes’ later when Kieran Barnes hit a shot from distance which Schmid parried away, but Charlie Payne followed up to net the rebound and put Baldock into a 2-0 lead. Late in the half Leverstock were denied a chance to get back into the game. There appeared to be a clear handball by a Baldock defender in the penalty box, but the referee waved away the claims for a spot-kick. Two minutes into the second-half there was another big moment for the Green when a poor back header gave Cameron the chance of a clear shot at goal. Harpur got a hand to the shot, but it was still heading for the net until defender Marcus Crowther scrambled back to clear it off the line. Cameron was denied again in the 64th minute when he hit a great shot from the edge of the box but it was tipped over the bar by Harpur. There was little else in the way of chances during the second period, with Baldock creating few chances to trouble Schmid, but Leverstock just couldn’t find a goal to get them back into it. The Green were due to host eighth-placed Colney Heath last night (Tuesday) before visiting sixth-ranked Potton United this Saturday.